Manny Pacquiao has come a long way from a life on the streets in Santos City, the Philippines to participate in a mega fight versus the undefeated Floyd Mayweather on May 2, 2015. This global icon and charitable athlete now walks the streets, throwing money right and left, the US president took him to the White House, he no longer paints curls in red color, grows a beard and mustache, and a jog across the plains and hills around the Philippines accompany him a crowd of journalists and the local population. He trains vigorously and is loved by millions of people as he humbly promotes his causes. 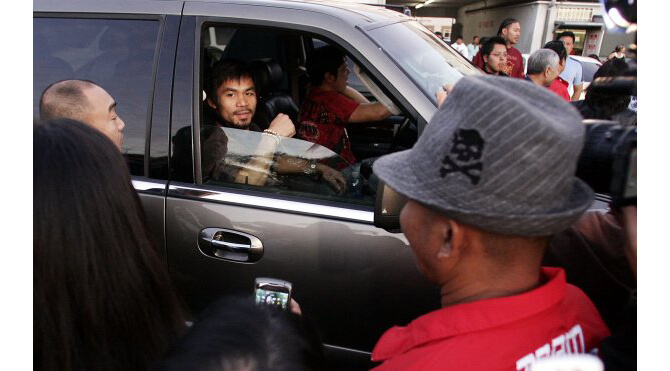 Manny now travels often between the United States and the Philippines driving any type of luxury vehicles he prefers. See the luxury cars Manny Pacquiao rides in preparation for the Las Vegas fight versus Floyd Mayweather.